"I was sat in this assembly hall doing what you're doing and now I'm at radio 1. Sometimes I wake up and think about all the things I've done and the people I've met and just think this is mad. I got there myself; I didn't know anyone in the industry. With a bit of luck, a bit of talent and huge hard work you'll get where you want to be". In February, 2016, Future First took part in Radio 1’s 1 Million Hours campain, which aims to encourage young people to give up time to volunteer in their communities. 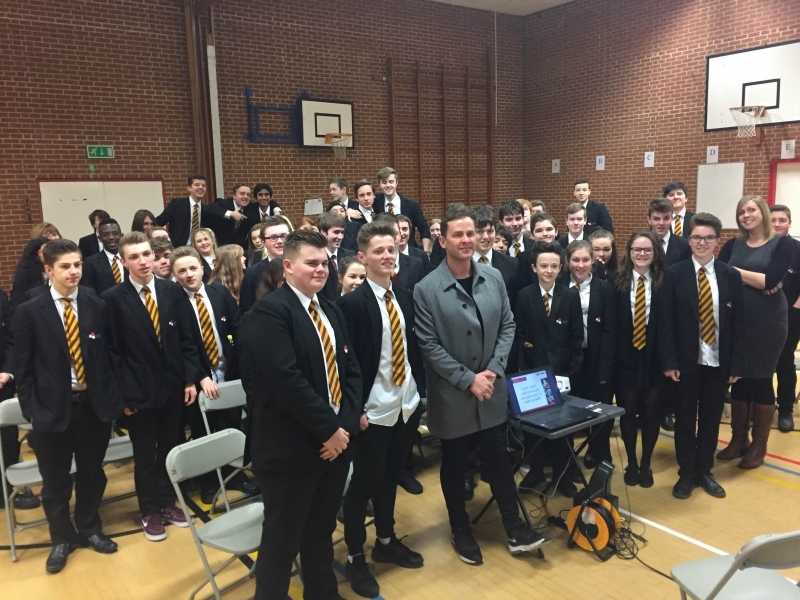 The campaign kicked off with Future First taking Radio 1 presenter, Scott Mills, back to his old school, Crestwood College in Eastleigh, to speak to Year 8 students about the possibilities of a career in media. The event was a fantastic success. Scott spoke about his experience at school, and his persistence to find work experience on local radio channels. He was made honorary Deputy Head Boy after chatting to current students about his career path which took him from Hampshire local radio to acting, an appearance on BBC TV’s Strictly Come Dancing and presenting Radio 1’s weekday afternoon show.